Blackcurrant seed oil is unusual, in that it contains two fatty acids which are important in human metabolism but which are rarely found in the normal diet - gamma-linolenic acid and stearidonic acid. For this reason, blackcurrant oil has been developed as a nutritional supplement and cosmetic ingredient. The yield of seed (and hence oil) is too low for it to be viable as a stand-alone farm crop, so the oil is obtained from the fruit residue which remains after the juice has been extracted, as a by-product. Comprehensive listing of scientific references since 1988. Chemical composition of blackcurrant oil. Overview of possible health benefits and adverse effects. 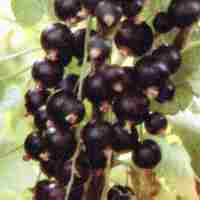 Monograph on medical uses of black currant oil. Report of scientific study on the effect of dietary supplementation with black currant seed oil on the immune response of healthy elderly subjects (1999). Discusses the use of oils containing GLA in the treatment of rheumatoid arthritis. Some pointers to possible side effects, interactions and warnings in the use of blackcrrant oil. Overview of the possible benefits and uses of black currant oil. Suppliers of blackcurrant (starflower) oil capsules. Own-brand soft gel capsules available online or from their High Street shops. Soft gel casules containing supercritical CO2 blackcurrent seed oil. Suppliers of blackcurrant oil capsules. Oil in 500mg capsules in a range of pack sizes. Soft gel capsules available on the internet. Ultrafine skin cream containing blackcurrant oil, cereal liposomes, natural fading substance. Martha Hill Blackcurrant 5 minute face mask. Clean, dry seed and pomace, derived from UK and European-grown fruit, is normally available from this family-owned company near Bristol. GSK (previously Smithkline Beecham) produce the Ribena brand of black currant juice at their own factory. The seed is available as a side-product. Suppliers of blackcurrant seed and pomace (dried fruit residues). Provide an oil refining service, as well as selling a range of bulk oil products. Consulting engineer with wide experience in extraction equipment for speciality oilseeds. Supercritical CO2 extracted blackcurrant seed oil, and a toll extraction service. Statfold offer an oil refining service from their factory in Staffordshire. They also sell speciality oils. Oil extraction service and bulk supplies of oil at competitive prices. Suppliers of speciality ingredients to the cosmetics industry. Supply both normal and organic oil. Supplies a range of speciality oils in bulk and in capsules (both gelatine and soft starch). Suppliers of a very wide range of vegetable oils. Suppliers of bulk natural oils. A new supplier offering a wide range of speciality vegetable oils. Bulk oil suppliers for cosmetics. Supply a wide range of wholesale oils, in small or large quantities. Not all product lines are listed on their website so, if you can't see what you need, ask. Suppliers of nutritional ingredients to the healthfood trade, as raw materials or finished dosage forms. Multinational company with facilities in North America and Europe, specialising in softgel capsules. Encapsulation service based in British Columbia, Canada. Offer soft gel encapsulation from their factory in California. Previously R P Scherer, who invented the softgel manufacturing process in the 1930's, and are still major manufacturers of capsules and a wide range of other delivery systems. DCC (previously Eurocaps) offer an encapsulation service in a range of capsule sizes. Site features English, Dutch German and French versions. A privately-owned company with modern equipment, producing soft gel capsules for nutritional and pharmaceutical companies to GMP standards. Also has its own range of filled capsules for sale in bulk or pre-packed. Meldex manufacture encapsulation machinery (the XGel system) which provides a vegetarian alternative to gelatine, at lower cost. Toll manufacturing facilities may also be available. Softgel manufacturing company based in New York state sells filled capsules or will manufacture using the client's oil. The largest soft-gel capsule manufacturer in Asia with a capacity of 5 billion per year. Swiss company with offices in the US and many European countries, offering a range of softgel capsules, including a vegetarian version. Web site also available in German. Wide range of analytical services, including pesticides, heavy metals and microbiology. Full lipid analysis service, operating from the Scottish Crops Research Institute, which is generally recognised in the GLA field as being the 'gold standard'. 16 MB of files about all aspects of lipids available on the site. Basic tests for oil content and fatty acid composition. RSSL provide a comprehensive range of food analysis services. Large company whose analysts regularly win prizes from the Americal Society for Oil Chemists (AOCS), offering a wide range of oil analysis services. The Bacterial Identification and Fatty Acid Laboratory can provide full fatty acid analysis using gas chromatography. Their speciality is bacterial strains, but they can also analyse plant tissue and oil. If you should be interested in selling blackcurrant seed, or in buying the oil extracted from the seeds (which is rich in important fatty acids) I may be able to help, through my consultancy business. For more details, see my home page. email me with the address (URL) and I will consider it for inclusion. There is no charge for this service.